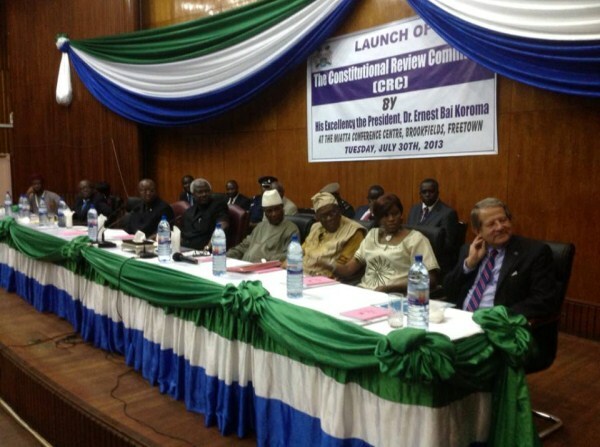 HomeNews in PerspectiveConstitution review – Has president Koroma got an hidden agenda? No one has asked the people of Sierra Leone – the ordinary man and woman in the villages, towns and cities – 70% of whom cannot read or write – earning less than one dollar a day, what the Constitution of Sierra Leone means to them, and whether they would like to see it changed. But, be that as it may, the government and sections of the international community believe that the country’s constitution must be reviewed, and to what end – 70% of the population are likely to be uncertain. There is no argument against a review of the constitution. What is in question is the purpose of the review; the extent to which ordinary people understand what the constitution is; why it needs to be reviewed, and what they are being asked to do. These questions are pertinent, because there are suspicions that president Koroma is hoping to use the constitutional review process, as a form of popular referendum that could usher in sweeping changes to the constitution, including extending the fixed two terms for a sitting president to three terms. So where lies the truth? The need for a constitution review originated from the report of the country’s Truth and Reconciliation Commission (TRC), as well as Article 10 of the Lome Peace Act 1999 – as part of efforts to bring the war to an end. The Truth and Reconciliation Commission (TRC) was established in 2002 to investigate the root causes of the ten year long brutal civil war, and make recommendations as to how best to build sustainable peace, promote justice, equity, democracy, and human rights. Among the range of recommendations put forward by the TRC, the report urged the government of Sierra Leone to pay “serious consideration” to the creation of a “new constitution”, in furtherance of building lasting peace, promote justice, equity, democracy, and human rights. But after ten years since the TRC and its recommendations, successive governments have felt quite comfortable with the 1991 Constitution, and have not necessarily seen the urge for change. Ironically, four successful general, presidential and local elections have been held under the aegis of the 1991 Constitution, though with unpalatable consequences that seriously calls into question the tribal based multi-party democracy that operates in the country. Will the constitution review be allowed to address this anomaly? There are many in Sierra Leone who believe that if the present form of multi-party – first past the post democracy is not changed, it would be impossible to build sustainable peace and promote equitable development across the country. So what is wrong with the 1991 Constitution? There have been several comments and proposals for the reform of the 1991 constitution, published in the country’s media recently. But ask politicians in Freetown to tell you what is wrong with the 1991 constitution, and you are likely to get a wall of silence or incoherent mumbling. And so too, it seems the majority of Sierra Leoneans, who quite simply are confused about the process, and more preoccupied with putting one square meal on the table, rather than concerning themselves with constitutional language they hardly understand. But the international community – the underwriters of the country’s peace dividend, are refusing to let the need for a constitution review – as recommended by the TRC and Article 10 of the Lome Peace Accord, become another unkept promise by State House. With a strong and coherent voice, led by the United Nations Development Programme (UNDP) Office in Freetown, and supported by the United Nations Integrated Peacebuilding Office in Sierra Leone (UNIPSIL), the international community are ensuring that the review – one way or the other – is carried out. The Sierra Leone Conference on Development and Transformation, staged by the government in 2011, also upheld the call for a constitution review. And in July last year, president Koroma launched the Constitution Review Process, after the formation of a Committee made up of 80 representatives from civil society groups, political parties, the media, and other stakeholders. The Committee is chaired by Justice Edmond Cowan – a retired supreme court judge and former speaker of parliament. But how true is president Koroma to the review process? “This review shall be true to the processes prescribed in the constitution for its alteration. The committee will submit its recommendations to my government. Government will in turn look into the report, and submit it to parliament. If parliament approves, it will then be put into a referendum for the people to decide the fate of the proposed covenant,” said the president, last July. And the UN is pinning its hopes on president Koroma delivering a honest and transparent review that is devoid of partisan political agenda. Analysts say that with a cost of more than $4 million to deliver – this constitution review does not come cheap. The process is entirely funded by the Department for International Development (DFID) and the European Union (EU). But since launching the review seven months ago, there have been concerns that the process lacks a bottom-up approach, and that it had only succeeded in engaging with the country’s political class and elites, rather than the masses. Critics say that the review process has lost its traction. The voices of the majority of the people of Sierra Leone have been excluded from the process. It is expected that the revised constitution will be adopted by a national referendum, following the review process. But there are serious challenges ahead. “There is a strong need for a strategic plan for the whole process, followed by various work plans and operational plans,” says Justice Cowan. This technical workshop was organised by the UNDP, following a consultative meeting held in Kenema at the end of January, 2014, involving over one hundred paramount chiefs. The Kenema meeting was attended by government ministers, local government and parliamentarians, and members of the Constitution Review Committee. “The constitutional review process is a unique opportunity for voices to be heard and to consolidate and safeguard Sierra Leone’s hard-won gains over the years in an inclusive way,” says Jens Anders Toyberg-Frandzen – head of UNIPSIL. Sierra Leone’s constitution dictates how the country is governed. It defines the relationship between the state and society; and makes explicit the rights and duties of citizens. It also defines and confers citizenship. In essence, the constitution should provide the basis and framework through which, society should function in harmony – politically, socially and economically, assuming that the rule of law prevails; and that those in power respects the constitution, and enforce the laws fairly and equitably. – The right to good health – average adult mortality is less than 46 years. There is a strong argument that the current system of democracy and governance from the centre, has woefully failed the people of Sierra Leone. This constitution review must therefore focus on a new direction – DEVOLUTION OF POWER to the regions. 1. Are you happy with the way you are being governed from the centre at State House and parliament? 2. Would you like power to be transferred to local people – through devolved regional development authorities, so that they can make life changing decisions about local economic development, social welfare, health, education, housing, water, electricity, sanitation, and other policy issues? The constitution should have been reviewed and presented to the nation for any changes necessary. But unfortunately, the president chose to pick and chose, before we can have a say. For example, the role and appointment of Speaker of the House was part of this review process. But president Koroma chose to expedite that section for his own convenience and went on to appoint his kinsman. So I wonder whether this means anything to Sierra Leoneans who are not APC members and supporters. Now the president wants to hijack the constitution in order to achieve his third term ambition. The changes to the constitution has been held back until launching of his “After-U-NA-U” APC group to publicize his intentions, before urging approval for changes to the constitution from his APC parliamentary majority. This is not democracy, and NOT in the interest of the people of Sierra Leone. I think almost every family in the society is represented in our learning institutions. So how involved are the universities and high schools in the constitutional review? Let us be careful about this constitution review exercise, because we already have a frustrated society. Any further frustration will be too much for the people of Sierra Leone to accept. Why do they want to change the constitution? The thing with politicians, as soon as they are in power they forget about the people in the villages. All they talk about is Freetown. But not all of us are from Freetown. I for one, I am from Kono and I am going to be living there and help my people, because which ever party is in power, they do not to care about the people in the provinces – even though their root is from there. Before you start talking about changing any thing in the country, you have to let the citizens know what it means and it effect on them. Even though they cannot read or write, their representatives in parliament should first go to these people and explain what constitution means, and how it affects their daily lives. Although they cannot read the so called constitution, but they are not stupid. They are even more intelligent than your so called parliamentarians. I think it is about time that these political parties start treating the citizens of Sierra Leone with respect.